Yeey, another how to! This week: How not to be afraid! Nowadays people are pretty much scared of everything. Arachnophobia, Aulophobia, Diabetophobia, Gnosiophobia, Menophobia, Thermophobia or maybe Zemmiphobia. These are just some random phobia’s. You would be surprised how many there are. But some fears make sense. Spiders are scary. People weren’t meant to be in small confining spaces. Being high up in the air is terrifying. Sharks aren’t cute and neither are snakes. There are some pretty scary things out there. I wouldn’t want to offend anyone by saying their fears aren’t valid, but fear seems to be taking control of our lives. The thing is things aren’t worth doing if they don’t scare you. I wrote a book and send it to different publisher. Scariest thing I’ve ever done in my life. It’s hard to do things we can’t control, but that’s often when the best things happen. So this Tuesday I have some tips to not be afraid. Tip one: Is it a code red situation? Ask yourself if you doing the thing you’re afraid of is going to kill you. Is it even necessary (a shirt has one collar, two sleeves! Anyone get it?) to be afraid? Just remind yourself the longer you keep thinking about it the worse your brain will make it seem. I mean the spider started out as a little creeper, but after a while your brain will convince you you’re fighting a dragon. Make sure you keep it real. Tip two: What’s the worst thing that could happen? I mean really. Tip three: Count till three. Don’t give yourself the time to back out. Count till three and ask that cute guy/girl out on a date. It only takes three seconds of courage and it can change your life forever. Tip four: Think of the reward. Facing your fears head on and walking away unharmed is one of the best feelings in the world. Even when you lose you’ll feel like a winner. You did something scary. That’s awesome. Go you! Have a cookie. Just remember it’s okay to be afraid just don’t let your fears stop you from doing the things you love! You deserve that! Don’t go looking for someone else to save you. 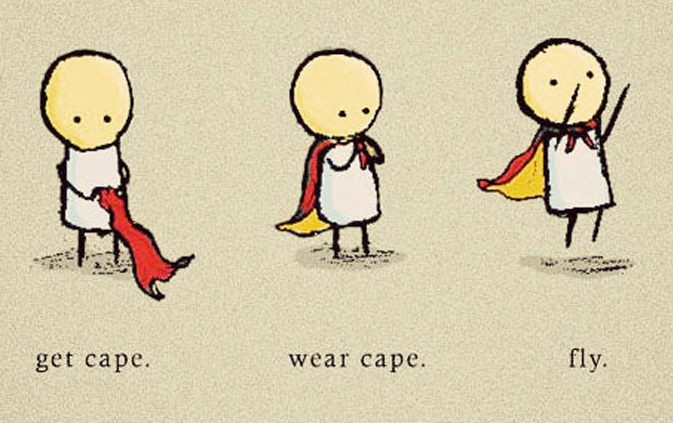 Be your own superhero.